In the first phase of our project we have been working on researching what are the most relevant competences that students of Arts & Humanities faculties lack and would like to develop in order to have a more entrepreneurial approach to their life, projects, job. This research is today very relevant not only for Arts & Humanities but in general for Creative Industries and the future of work. 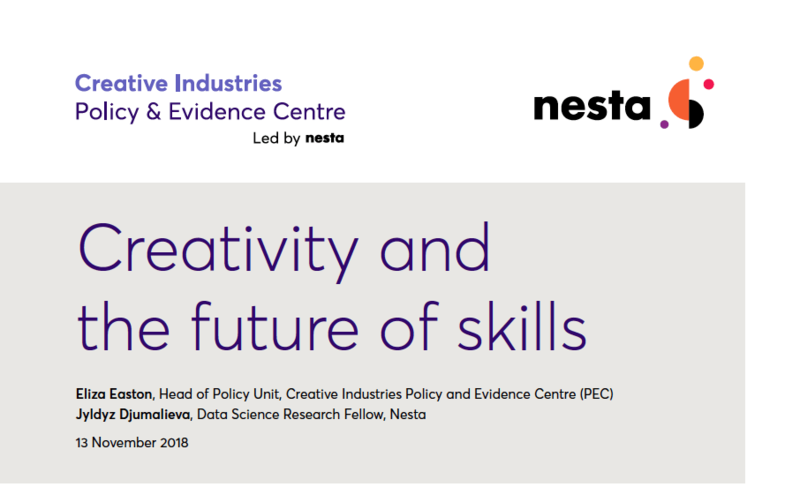 In this framework we share with this article the research Creativity and the Future of Skills from the Creative Industries Policy and Evidence Centre (PEC), written in partnership with Nesta researchers. The PEC is led by Nesta and is funded by the Arts & Humanities Research Council as part of the UK Government’s Industrial Strategy. The Centre works to support the growth of the UK’s creative industries through independent research and policy recommendations. In contrast to creativity, and those skills mentioned above, requirements for other transferable skills – such as being detail-oriented, having customer service skills and basic computer skills – turn out to be negatively linked to an occupation’s prospects for growth. The research also analyses how the word creativity is being used in the job market. It finds that there is a strong demand for ‘creativity’ in particular occupations. Although others have argued that the term is ubiquitous, ‘creativity’ is barely mentioned in the majority of adverts. UK has always been at the forefront of research in the sector but what about the other European countries? If you are curious do not miss our report soon to be published. The full research “Creativity and the Future of Skils” can be downloaded here.